Within a dynamic and changing European context, knowledge of another European national legal system and its law is a valuable asset, both academically and professionally. This four-year programme includes a year at Université Paris II Panthéon-Assas and leads to the award of a Bachelor of Laws degree from UCL. A score of 19 points in three higher level subjects including French at grade 6, with no score lower than 5. A combined score of 17 achieved in three higher level subjects with no score lower than 5. 6 in HL French required. Successful completion of the WBQ Advanced Skills Challenge Certificate plus 2 GCE A-Levels at grades A*AA, to include French. You will spend your third year abroad studying French Legal Studies at Université Paris II Panthéon-Assas. The international scope of our degrees is reflected in the content of different topics, itself reflecting the expertise of our staff in international and comparative law. All UCL Laws undergraduate programmes are recognised as qualifying law degrees (QLDs) by the two main legal professional bodies—the Bar Standards Board and the Solicitors Regulation Authority—for the purpose of exemption from the academic stage of their professional examinations. First-year students are required to take a module in French law, taught in French and including law, legal institutions and legal terminology. The department does not offer language tuition and students will be responsible for maintaining, or, if necessary, improving their linguistic ability in French to meet the academic demands of the degree. Second-year students are required to take the European Legal Studies module, which includes tuition in French about the law and legal system of France. The third year of study is spent abroad at UCL's partner university in France. The typical programme of study for this year leads to a certificate in French Law and comprises two full-year courses plus six one-semester courses in Civil/Private Law, Public Law and other optional courses in French Law. Students who have the requisite level in French and French Law may also apply to undertake more courses during their year abroad to gain a licence 3 qualification in addition to their LLB (subject to approval by UCL Laws). In the final year you will return to UCL and will choose four optional modules from a list. One of them could be a research essay on a legal subject of your choice, subject to approval by the department. Students who have been awarded a Bachelor of Laws and a Certificate in French Law will be eligible to apply to study for a Master 1 in Paris II. Please note: students enrolled on this programme will only be permitted to transfer to the three-year LLB degree in exceptional circumstances. You will spend your third year abroad at UCL's partner university in France. You will be taught through a combination of lectures, seminars, and tutorials with eight students. We encourage substantial student participation and class discussion in seminars and tutorials, on the basis of prepared work. Considerable emphasis is placed on small-group teaching where you will benefit from individual attention and advice. You are required to pass written examinations each year for most modules. In some cases an essay also counts towards the final module mark. 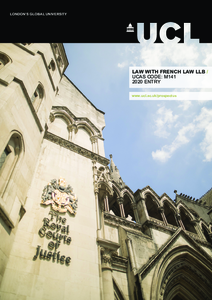 Detailed course descriptions are available on the department website: Law with French Law LLB. As a law student you will be encouraged to develop a critical awareness of how the law works and how it may be changed, to sharpen your powers of reasoning, and to develop both the technical expertise to solve legal problems and the capacity to determine whether a solution is fair and just. The wide range of skills and subjects learned throughout your degree open up many opportunities when you graduate. Many UCL Laws graduates move directly to further vocational study and train to become solicitors or barristers. Recent graduates have also chosen employment in government, political service and commercial management. Some have selected to undertake further academic study. We are seeking dedicated candidates who have an aptitude for exploring arguments and ideas. Your ability to formulate and express thoughts and opinions is critical, as is a demonstration of the reasoning skills that are at the heart of a legal education. You should possess an informed interest in current affairs and in the world around you. Candidates are assessed through their UCAS applications, the National Admissions Test for Law (LNAT) and, in some cases, by interview. You are required to take the LNAT as soon as possible after submitting your UCAS application and no later than 20 January in the year in which you are applying. Applicants must link LNAT registration details to UCL. Although your proven academic achievements are important, a detailed knowledge of law is not required. Demonstration of your perseverance in past achievements (e.g. in your academic work) along with a strong, genuine and intelligent motivation for studying law will contribute to your successful admission to UCL.